This week in France, the Toulouse public prosecutor announced the opening of a judiciary prosecuting case against Toulouse Imam Mohamed Tatai for incitement to hatred, following his December 2017 sermon on killing Jews. The announcement was widely covered by media in France and elsewhere, and many of the news reports on the prosecution mentioned the original MEMRI translation of the sermon. On June 28, 2018, MEMRI released its translated clip of a sermon delivered in Arabic by Mohamed Tatai, then-imam of the Mosquée Ennour in Toulouse, France and currently leading imam at the newly inaugurated Grand Mosque of Toulouse, as well as president, since 2005, of the Circle for Civil Dialogue (Cercle du Dialogue Civilisationnel), a nonprofit aiming to "facilitate dialogue between citizens on a social-cultural level." Tatai was also reportedly close to the Algerian Sunni Islamist political party Islamic Salvation Front (FIS). In his sermon, which he gave on December 15, 2017, Tatai recounted the well-known hadith about what will happen in the battle between the Muslims and the Jews at the end of time: "[The Prophet Muhammad] told us of the final and decisive battle: The Day of Judgment will only come when the Muslims will fight the Jews. The Jews will hide behind the stones and the trees, and the stones and the trees will say: 'Oh Muslim, Oh servant of Allah, a Jew is hiding behind me, come and kill him, 'except for the Gharqad tree, which is 'one of the trees of the Jews.'" He then stated that Israel would soon come to an end: "The Israeli prime minister... said that he was afraid that Israel would not live longer than 76 years – as is written in the prophecies of [the Jews]. Therefore, when their president died two years ago, and people came to pay their last respects, one of their well-known journalists said: 'People did not come today to the funeral of Peres, but to the funeral of Israel.'" The sermon was posted on the YouTube channel of the Grand Mosque of Toulouse on January 30, 2018. This hadith, which refers to the End of Days when the Muslims will fight the Jews and kill them, is regularly cited in antisemitic sermons and statements; MEMRI research has identified it many times. Its use in an antisemitic sermon in Toulouse, France, and its reference to killing Jews, is of particular concern in light of the growing Muslim antisemitism throughout France and the 2012 murder of schoolchildren and a teacher at a Jewish day school in Toulouse by jihadi Muhammad Merah. At the June 23, 2018 inauguration of the Grand Mosque of Toulouse, Tatai also underlined that the new mosque would "instill the values of peace" as a "bulwark against extremism." He also said, "The Grand Mosque doesn't only benefit the Muslim community, it benefits all the people of Toulouse in terms of culture... The mosque is proof of the respect and tolerance among all people of Toulouse." The MEMRI TV clip was extensively covered by media in France and internationally, and numerous French politicians, public figures, and groups called for action to be taken against Tatai. French prosecutors launched an investigation into him for "possible incitement to hatred." According to media reports, Tatai said that his remarks were taken out of context and did not contain incitement to violence against Jews. He added: "This translation [i.e. by MEMRI] is somewhat modified as it was taken out of context [...] This message warns us that we shouldn't commit these acts if we want to avoid the last Judgment." Subsequently, on July 5, 2018, a video was posted on the YouTube channel of the Grand Mosque of Toulouse in which Imam Tatai clarified that in his statements in his sermon about the end of Israel he had been talking about the end of the state of Israel, not the end of Judaism as a religion or of the Jews as a people. He did not, however, mention his use of the hadith. MEMRI released a translation of this clip as well. To view this clip on MEMRI TV, click here or below. 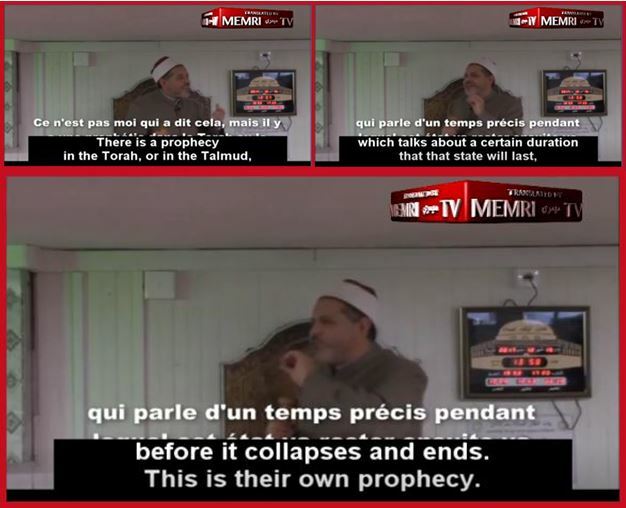 This MEMRI TV clip exposing antisemitic statements by a prominent imam who is also a leader in interfaith efforts is another example, in this case from France, from our project that identifies and exposes such imams in North America and across the West. 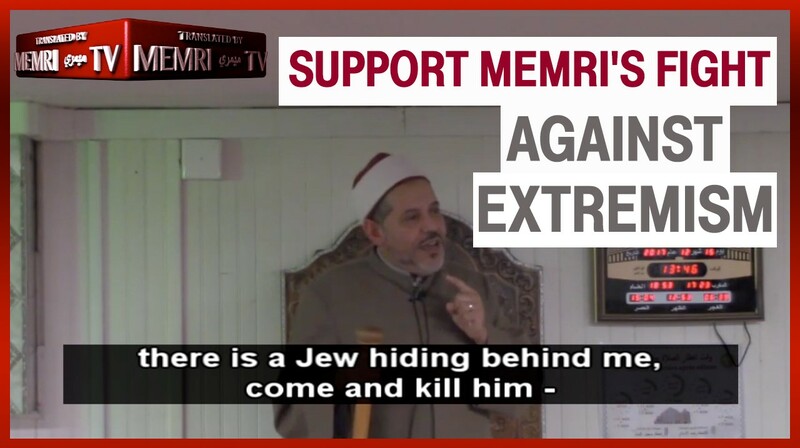 Over the past two years, MEMRI translations of antisemitic and hateful statements by imams in the U.S., Canada, Spain, Germany, Italy, Denmark, Australia, and other countries have led to lawsuits and other legal action against them on charges such as incitement to hatred and violence, connection to terrorism, and more. MEMRI is also seeking out and promoting imams and others speaking out against hatred and violence. MEMRI research and translation efforts are an increasingly costly endeavor, and as a nonprofit organization our efforts are made possible only by readers like you. Producing MEMRI TV clips demands extensive and advanced technology and human expertise – from monitoring, recording, and reviewing raw programming to translating, captioning, and uploading clips. Please help us today to continue this work, with your tax-deductible donation to our Summer Campaign. 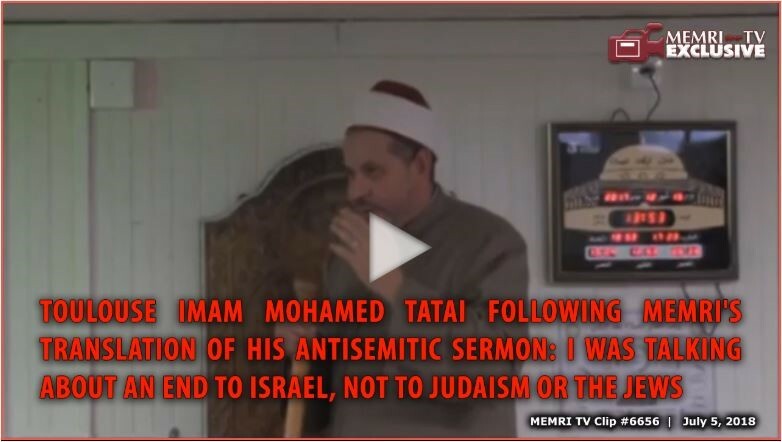 The MEMRI TV clip translating Imam Tatai's December 15, 2017 sermon in Toulouse was widely covered by French media, and led to denunciation, legal complaints, and action by public figures, French Jewish groups, and authorities. It also led to responses by Tatai, and defense of him by French and Algerian Muslim leaders – and then a reversal to "strong condemnation." 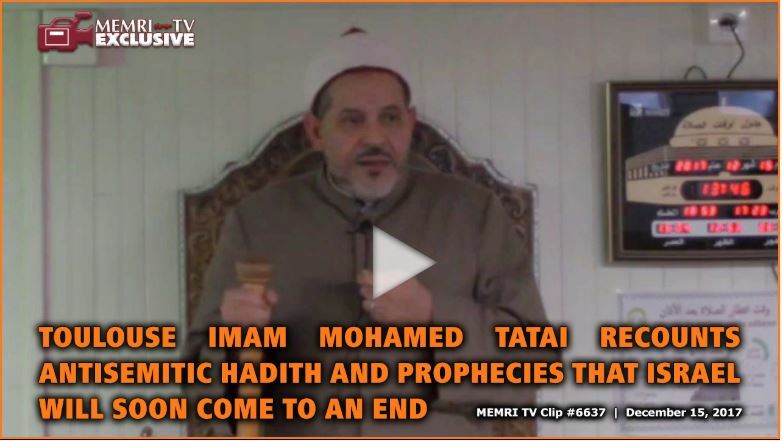 For the full review of the events that followed the release of the MEMRI TV clip, as well as other sermons by Imam Tatai translated by MEMRI, click here.